Perhaps it is in keeping with his playing pedigree as one of the great left wingers that Ryan Giggs would make such a left-field selection. 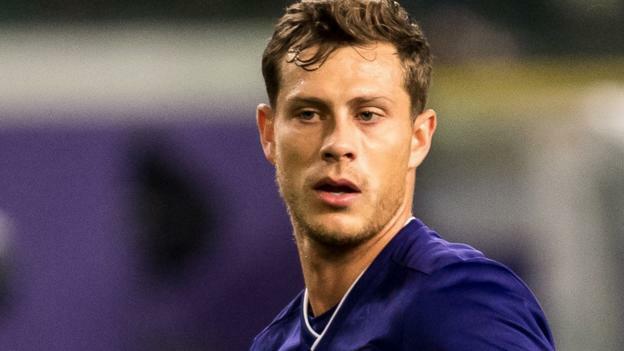 James Lawrence of Anderlecht was not so much a name unfamiliar to Wales fans but one that had to be quickly hammered into internet search engines when manager Giggs named his squad for the games with Denmark and Albania. Out of the blue and into a red shirt. Not even the football hipsters could make a confident claim on this one. “I’m not well known in Wales or the UK so I could see how it would come as a surprise to many, but I knew it was in the works and there was a possibility of it happening,” says the 26-year-old Lawrence. It is a fair bet to say Lawrence’s footballing story and rise to his recent international selection would be met with nods of approval from those who like their back stories more continentally quirky than conventional. After all, the centre-back from Henley-on-Thames will arrive in the Cardiff camp next week via a European education in the Netherlands and Slovakia. And that’s before mentioning studying for a degree, being inspired by Johann Cruyff and having survived a heart scare. “Yeah, I’ve definitely been though a lot,” says Lawrence, who left behind youth football at Arsenal – where he was a very early team-mate of Harry Kane – and QPR when his parents Steve and Lynne moved to Amsterdam 10 years ago, sending off emails in the hope of a trial. “We got a reply from a small club called Haarlem and I went there just to continue playing football and to enjoy it and it turned into something much, much more. Within a short time at the iconic Eredivisie club, Lawrence was staring starry-eyed at his new coach and looking ahead to a very different career than he might have imagined. “Working with Dennis Bergkamp was a dream come true,” Lawrence says. “I’d looked up to him for most of my childhood and, although I already had expectations of such a big club like Ajax, they were completely blown out of the water when he walked in. “My time there was very educational; it took my playing and thinking about the game to another level. His transfer this summer came after a move from Dutch youth football to the senior game in Slovakia with AS Trencin, where he spent four years and collected two domestic titles, playing in Europe along the way. Again, hardly the conventional route. “I’ve always just gone with the flow,” Lawrence says. “I’ve not thought too much about where I was but more what I was doing. “To me the decisions were easy to move to Europe and try to play at the highest level I could. It was the same moving to Slovakia, playing for the champions and winning the double and playing in Europe. Perhaps the leaps into the unknown make a little more sense given the jolt Lawrence received a year into his time with Ajax when a health scare saw him require heart surgery. First put down to a flutter, the step-up in intensity after going full-time saw him diagnosed with tachycardia, where his heart rate would worryingly race during training. “It was pretty scary at the time. I was a young lad and I had to have an operation to burn a piece of the wall of the heart off so it could function normally,” he recalls. As a back-up to his career – and with one eye on the future – Lawrence undertook a masters degree in international sports business management at the Johan Cruyff Institute in Amsterdam. His father still works as a consultant for the Johan Cruyff Foundation that provides and supports sporting activities for disadvantaged children, where Lawrence also spent time volunteering and got to meet the icon of ‘Total Football’. “He was a huge inspiration, someone who had a real presence about them – when he had something to say, you listened,” he says. Since his father and agent made the Football Association of Wales aware of his eligibility, via a grandmother from Pembrokeshire, Lawrence has been listening out for the phone call from Giggs. “I knew they were having a look at me and to get the call and the chance to work with such prestigious players and coaches is a dream come true,” he adds. “I do think that my time in Europe can help. I’ve experienced different styles from youth football in England, Dutch football, Slovakian, Belgium, European, and I think it makes me more adaptable which coaches like. As he prepares to join up with his new Wales team-mates, the European unknown with the unconventional route to the red shirt is ready for his next step.